NEW YORK– It’s an ordinary day at Akwesasne: drones fly high overhead; Border Patrol’s presence is palpable; and cellphones are rarely used because they may be tapped. The village spans the northeastern New York-Canada border, and with listening devices, chemical detectors and X-ray equipment, the U.S. Customs and Border Protection station is among the most sophisticated in the country. As Mohawks travel back and forth through their community, going to work and visiting family on each side of the border, their cars are even weighed. The people here say the government has been spying on the Mohawk Indian reservation for decades. But until recently, these concerns were mostly just suspicions. WikiLeaks has released documents revealing corporate and government surveillance of the Mohawk people’s relationships with foreign countries, as well as evidence that movements that could block corporate plans for oil and gas were tracked and that Native American communities were monitored for the U.S. Department Homeland Security. The documents — among 5 million of WikiLeaks’ Global Intelligence Files — were released this month. Disclosures include emails from Stratfor, a Texas-based company that provides intelligence for corporations, such as Dow Chemical Co., Lockheed Martin, Northrop Grumman, the Raytheon Company, and U.S. government agencies, including the Department of Homeland Security, the Marine Corps and the Defense Intelligence Agency. An Oct. 20, 2008 email sent by a Stratfor employee to Stratfor’s Analyst List hinted that the Mohawk and Cree tribes may have been responsible for a series of pipeline bombings in Canada that month. “While it’s too early to link these pipeline bombings to the Olympic protests, the attacks certainly have brought to the surface contested issues like oil & gas exploration and indigenous rights. To me, it seems like there is too much in common here – any attention = good attention for protesters and, as long as they can keep a safe distance from the actual bombers, they can benefit from these attacks,” the email said. The Mohawks in upstate NY were also engaged in violence. them), and now the Cree in BC. more common (though doesn’t occur frequently). The Oka incident mentioned in the email was a violent conflict between First Nations and the Canadian government that began on July 11,1990 and ended Sept. 26, 1990. Marcel Lemay, a corporal with Quebec’s provincial police force, died from a shotgun wound that struck his left side, which his bulletproof vest didn’t cover. Commonly known as the Oka Crisis, the incident began after the Mohawk of the Kanesatake reserve filed a land claim for a nearby traditional burial ground. This claim was rejected in 1986, and even 20 years after the Oka Crisis, the land was part of a dispute between Mohawks, the government and developers. In 1989, Jean Ouellette — then-mayor of the town of Oka, located west of Montréal — announced that the land would be cleared to expand a private, members-only golf course and make way for 60 luxury condominiums. No environmental or historic preservation review was carried out. Members of the Mohawk community blocked access to the land with a barricade, which started with about a dozen people and eventually numbered into the hundreds. “These people have seen their lands disappear without having been consulted or compensated and that, in my opinion, is unfair and unjust, especially over a golf course,” John Ciaccia, Quebec’s then-Minister of Native Affairs, wrote in response to the mayor’s demand that the protesters be removed. In the months prior to the incident, Ciaccia had pushed for Ottawa to approve an agreement that would allow the Canadian federal government to acquire the territory in dispute and give it to the Kanesatake Mohawk. Mayor Ouellette called in Quebec’s provincial police force in response to the barricade. The Mohawk, in turn, followed their Constitution of the Haudenosaunee Confederacy and the women — considered the caretakers of the land and progenitors of the nation — told the protestors that no weapons should be used — unless police fired on them and they fired back in defense. 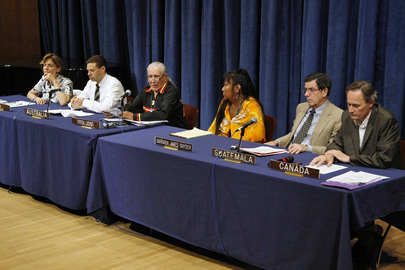 Oren Lyons, (third from left), Faithkeeper of the Turtle Clan of the Onondaga Nation, and member of Grand Council of Chiefs of the Haudenosaunee, addresses a panel discussion on the reconciliation between the indigenous peoples and the states, as part of the activities in observance of the International Day of the World’s Indigenous People. Other panellists seated with him at the podium (from left to right): Marcie Mersky, Liaison Officer with the United Nations Department of Political Affairs; Andrew Goledzinowski, Deputy Permanent Representative of Australia to the United Nations; Barbara James Snyder, of the Washoe & Paiute Nations; Gert Rosenthal, Permanent Representative of Guatemala to the United Nations; and Henri Paul Normandin, Deputy Permanent Representative of Canada to the United Nations on August 8, 2008. (Photo/United Nations). The police mobilized and tossed tear gas canisters and flash bang grenades at the protesters. The Kanesatake Mohawk were soon joined at the barricade by First Nations peoples from across Canada and Native Americans from the United States. The Royal Canadian Mounted Police were eventually brought in and 2,500 Canadian armed troops were placed on standby. Reconnaissance aircraft circled above, and 800 members of the Royal 22 took over for the police. After 78 days, the protestors surrendered to the army. “Could we see them targeting oil execs in Canada?” Stratfor’s Fred Burton wrote in an Oct. 20, 2008 email. attacks could be part of a much bigger movement. platform to get their point across. The town of Wounded Knee on the Pine Ridge Reservation in South Dakota, the site of an 1890 massacre, was taken over by about 200 Lakota and American Indian Movement followers on Feb. 27, 1973 in protest of a failed attempt to impeach tribal president Richard Wilson, who had been accused of corruption. The occupation lasted 71 days and U.S. Marshals, FBI agents and law enforcement surrounded the area. As gunshots rang out back and forth, a U.S. Marshal was left paralyzed and a Cherokee man and a Lakota man were killed. Ray Robinson, a father of three and black civil rights activist from Alabama, disappeared. Forty years later, the FBI determined that he had been murdered in the camp. “Robinson had been tortured and murdered within the AIM occupation perimeter and then his remains were buried ‘in the hills,’” an unidentified cooperating witness told FBI agents, according to FBI documents. Concerns that spies were infiltrating the occupation ran high. Annie Mae Pictou Aquash, a member of the Mi’kmaq from Nova Scotia, joined the American Indian Movement at Pine Ridge to support Native American rights. A local rancher found Aquash’s body by the side of State Road 73 at the northeast of the reservation on Feb. 24, 1976. During an initial autopsy, local medical examiner W. O. Brown estimated that Aquash had been dead for about 10 days and concluded that she had died from exposure. It was later determined that the 30-year-old mother of two young daughters had, in fact, died from a bullet to her skull. It wasn’t until 2003 that American Indian Movement members Arlo Looking Cloud, Theda Nelson Clark and John Graham were indicted and convicted of murdering Aquash, per the orders of American Indian Movement leader Vernon Bellecourt, who suspected that the woman was an informant. Paul DeMain, an Ojibwe owner and publisher of the independent newspaper News From Indian Country, began investigating Aquash’s murder in the 1990s. After finding proof of the paranoia building up within the American Indian Movement, as well as proof that Aquash was not an informant but a gifted language teacher, DeMain began receiving threats and was accused of working for the FBI. documents on 7,200 citizens, including members of the American Indian Movement and the Black Panthers, among members of other student and anti-war movements. The CIA monitored Russell Means, a Lakota member of the American Indian Movement, after he stated he would expose the genocide of American Indians to Europe and seek European support. 2. RUSSELL MEANS OF THE AMERICAN INDIAN MOVEMENT (AIM), WHO HAS PRESENCE, A SENSE OF THE DRAMATIC AND RATHER EXCESSIVE RHETORIC, WAS MOST COMPELLING SPEAKER DURING MORNING MEETING. MEANS PREFACED REMARKS BY SAYING THAT THE INDIAN NATION WAS QUOTE: LIVING IN THE BELLY OF A MONSTER; THE MONSTER WAS THE UNITED STATES-UNQUOTE. HE ACCUSED OTHER WESTERN HEMISPHERE COUNTRIES OF FOLLOWING U.S. TACTICS (WHICH LEAD TO DEPRIVATIONS OF INDIGENOUS PEOPLE). HE CAUTIONED INDIANS NOT TO TURN THE OTHER CHEEK AS THEY HAD BEEN DOING FOR 500 YEARS. Means joined the American Indian Movement in 1968 and was appointed the organization’s first national director in 1970. He participated in the November 1972 occupation of the Bureau of Indian Affairs in Washington, D.C., during which the American Indian Movement protested the abuse of the human rights of Native Americans. Means became well known as the spokesperson during the occupation of Wounded Knee in 1973. In later years, he was active in international issues of indigenous people and worked with the United Nations to establish the International Treaty Council in 1977. In 1977, the CIA was also concerned about the Haudenosaunee delegation traveling to Europe to discuss issues of injustice and using their own passports as sovereign nations — not U.S. passports, according to the spy cable. The Haudenosaunee — today numbering about 70,000 — have never surrendered their rights as a people. Within the boundaries of New York state, they currently hold 39,000 square miles of their original land, representing .034 percent of their original homeland. It is here that all their ancestors have lived and died. It is here that the stories of the Earth’s creation and the epics of their history continue to be told. It is here that their children are born. From 1821 to 1842 there were attempts to remove the Haudenosaunee to Wisconsin and Kansas. In 1851, there was an attempt to evict the Seneca people from their lands at Tonawanda. In 1886, the Dawes Act tried to divide the Haudenosaunee lands. In 1924, they rejected the U.S. passage of a Citizenship Act, an attempt to make Native Americans U.S. citizens. During the activism of the 1970s, Augusto Williamson Diaz, a man from Guatemala, had a vision which he brought to the Haudenosaunee in 1974. He said that as America neared its 500th year, its indigenous people should be in the hall of the U.N. In 1977, Lyons organized with 145 Native North and South American leaders to address the U.N. about their concerns for indigenous people. The Haudenosaunee succeeded in gaining recognition as a non-governmental organization in the U.N.
After arriving in Switzerland, the mayor of Geneva invited the Haudenosaunee and their friends to a meeting, which they attended in full dress, seated at tables laid with elegant crystal and silver. Later, a meeting was organized for Deskaheh to speak to the public. He was tired, carrying a bag of papers, the evidence he presented as he relayed his story. On his way out, a little boy stopped him to say hello. Deskaheh put down his bag and shook the boy’s hand. That little boy would grow up to be the mayor of Geneva. While 145 people attended the first visit to the U.N., that number has multiplied to over 1,300 today. By 1982, their efforts had spawned the U.N’s Working Group on Indigenous Populations that resulted in a draft Declaration of Rights of Indigenous Populations. The 12-page U.N. Declaration on the Rights of Indigenous People affirms the rights to self-governance and to assert their distinct political, legal, economic, social and cultural heritage. “We had to battle through 11 years to get it to be a declaration,” Lyons said. The U.N. adopted the declaration on Sept. 13, 2007 by a vote of 144-4. The U.S., Canada, Australia and New Zealand — four countries with origins as European colonies — voted against it, but they have all informally endorsed the declaration since. WikiLeaks revealed U.S. concern that Bolivia and Mexico would attend the American Indian Movement’s Indian Treaty Convention, planned to be held in South Dakota in 1974. “The USG [U.S. government] would regard official participation in this event by any foreign government as inappropriate,” according to an unclassified cable from 1974. In January 1974, the U.S. State Department paid close attention when Soviet journalists planned to travel to Minneapolis for the trial of those who occupied Wounded Knee. The State Department tracked news coverage of Indian and human rights. BELIEVE VISITS MAY BE IN CONNECTION WITH RECENTLY BEGUN TRIALS OF PERSONS ARRESTED AT WOUNDED KNEE, S. DAKOTA, DURING TAKEOVER OF THAT TOWN. REQUEST EMBASSY BE ALERT TO SUCH REPORTAGE, PARTICULARLY ON SOVIET TV, WHICH NOT COVERED BY FBIS. On Nov. 9, 1972 a delegation of about 500 American Indians with the American Indian Movement traveled to Washington, D.C., as part of their participation in a Trail of Broken Treaties event to bring attention to the sub-standard living conditions and broken treaties affecting Native Americans throughout the country. Arriving at the Bureau of Indian Affairs expecting a meeting, the group instead found themselves being pushed aside. They took over the building in protest. The event gained national attention, as they forbid any police or government representative to approach the building. The protesters stayed for a week, leaving thousands of dollars in damage and contributing to the loss and destruction of many irreplaceable records. Among the protesters at the BIA was Sherrill Elizabeth Tekatsitsiakwa Cook, also known as Katsi, a Mohawk from Akwesasne. Of all the issues that affect Native American communities — such as water or fishing rights, treaties and tribal terminations, Cook says everything boils down to whether Native American women have the right to birth and raise their children according to their traditions. Cook had been part of the Women of the Red Power movement of the 1970s that grew into WARN, or Women of All Red Nations, after a meeting of women from more than 20 Indigenous nations met in Rapid City, South Dakota, to discuss health issues. They publicized the discovery of the BIA documents of government sterilizations on an estimated 70,000 Native American women throughout the 1970s. The procedures were performed by the Indian Health Service without the women’s consent, despite language barriers and under threats that they would lose their welfare benefits if they birthed another child. In some cases, teenage girls went in to have their tonsils removed and left without their ovaries.